Smiles were smiled and drinks were drunk, and before the press event ended and Herb Reichert and Michael Lavorgna and I had wandered off to a restaurant in the East Village, I extracted from Messrs. Spainhour and Solomon their promise to send me a review sample of Peachtree's new nova300 integrated amplifier ($2499) as soon as possible. Then, having sat down to dinner, I realized I'd left my camera at Stereo Exchange. Only after a great deal of running around was I able to sit down to DINNER 2.0. My review opportunity finally arrived in January, when Peachtree announced that, after a four-month delay, they were finally filling pre-orders for the nova300. 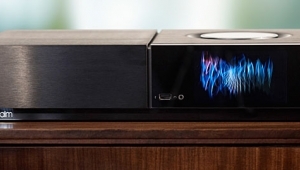 Although the new amp had apparently been ready for some time, Peachtree had endured a longer-than-expected wait for USB-I to approve the nova300 before securing MFi approval for Apple Lightning devices. Indeed, some nova300s had already been shipped without their iOS boardswhich, according to Peachtree, can be quickly and easily retrofitted. 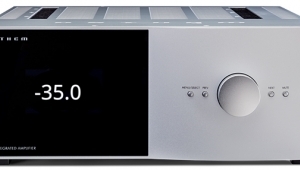 But because this feature distinguishes the nova300 from Peachtree's similarly recent nova150 and from the original iDecco integrated amp of ten years ago and its built-in iPod dock (remember those? ), Peachtree encouraged anxious audiophiles to wait. So I did. 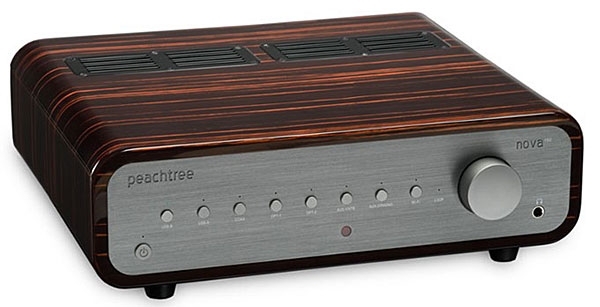 Wisely, the new nova300 retains Peachtree's trademark look: a physically substantial (14" wide by 4.8" high by 13.25" deep) amplifier in a sleek wooden wrap with rounded edges and a smooth, glossy finish. If anything, Peachtree has refined that formula: instead of medium-density fiberboard (MDF), the wrap is now made of high-density fiberboard (HDF), which is claimed to produce an even more precise fit; and the buyer now has a choice of Piano Black or Gloss Ebony Mocha finishes, both boasting multiple coats of hand-rubbed lacquer. My Gloss Ebony Mocha sample looks lovely. 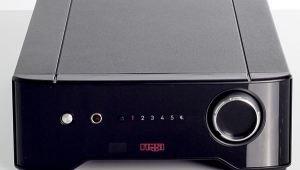 The nova300 also remains true to the job description of the original Peachtree iDecco of 2007: an all-in-one integrated amplifier and digital-to-analog converter. (I don't know if Peachtree was the first to bring such a hybrid to market, but it's safe to say they're the ones who put it on the map.) 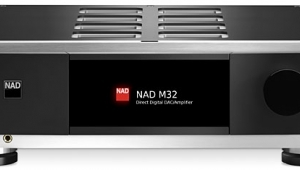 The nova300 ups that game as well: its DAC, based on the ESS 9018K2M Sabre DAC chip, provides 32-bit/384kHz resolution for PCM files and 5.6MHz for DSD files (ie, double DSD). 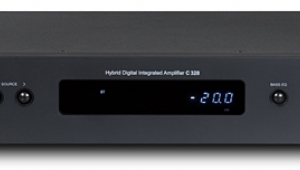 Digital inputs include one coaxial (RCA) and two optical (TosLink) S/PDIF jacks, plus two individually selectable USB sockets. The first of those, for USB Type B plugs, addresses the nova300's asynchronous USB receiver, itself based on an XMOS microcontroller; the second, for USB Type A plugs, is for Lightning-compatible iPhones and iPads, and includes Peachtree's Dynamic Noise Elimination (DyNEC) system, claimed to eliminate all power-supply and screen noise generated by the associated phone or tablet. 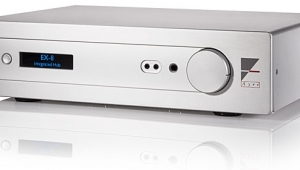 Additionally, the nova300 includes a moving-magnet phono stage with active RIAA equalization. 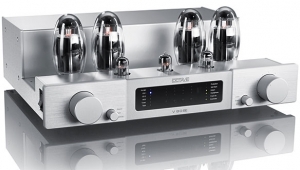 (Owners of moving-coil cartridges will need to add a step-up transformer or suchlike.) An optional WiFi board is in the works, and Solomon told me that Peachtree is "looking at the possibility" of soon adding MQA decoding. 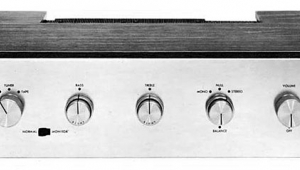 Thus the nova300 adds a number of things to the Peachtree formula, but there's also one thing it leaves out: Unlike earlier Peachtree electronics, which used a dual-triode vacuum tube, visible through a window in the front panel, for preamp-stage buffering, the nova300 is 100% solid-state. 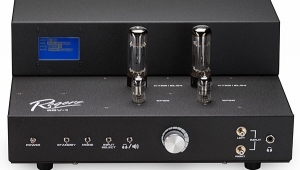 According to Peachtree's website, the nova300's preamp section has a signal/noise ratio of 111dB"and taking that 111dB down to 88dB with a tube follower would sound like you'd thrown a blanket over your system." 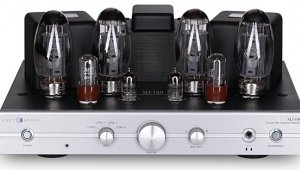 They add that, with the lower S/N (95100dB) of their earlier preamp stages, the addition of a tube buffer was "an acceptable compromise." 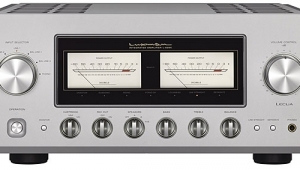 The preamplifier stage's very high S/N ratio may be partly due to a newly designed switch-mode power supply that switches at a very fast 425kHz (as opposed to the 100kHz of less advanced supplies), thus pushing some types of noise ever further from the signal. 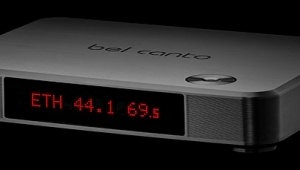 Coupled to that preamp is an output stage comprising class-D modules from the Bang & Olufsen subsidiary ICEpower; it produces 300Wpc into an 8-ohm load, and 450Wpc into 4 ohms. 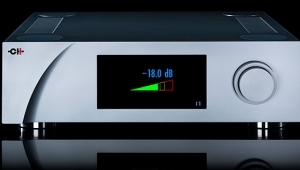 Also aft of the nova300's preamp stage is an all-discrete, class-AB headphone amplifier. For about half its time in my system, the Peachtree nova300 sat on my Box Furniture rack, not far from my analog sourcesa Garrard 301 turntable with EMT 997 tonearm and various stereo and mono moving-coil pickups, and Hommage T1 and T2 step-up transformers from Auditorium 23and drove my Altec Flamenco loudspeakers via Auditorium 23 speaker cable. For the rest of its time here, the Peachtree sat on a solid oak Stickley table near my desk and Apple iMac computer, driving the same speakers with the same speaker cables re-routed to accommodate the alternate position. 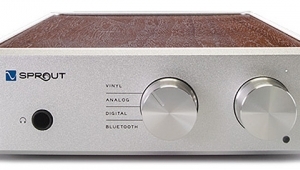 Of the nova300's eight inputseach selected by pressing one of a row of eight small, soft-touch buttons on its aluminum front panelonly two (Aux 1 and Aux 2) are geared for line-level analog signals, and one of those (footnote 1) serves double duty: Press Aux 2 briefly and its RCA jacks act as line-level inputs, but hold in the button for more than five seconds and those jacks become the phono inputs (footnote 2). To the right of that row of buttons is the nova300's volume knob, which is of the continuous variety (no stops at the extremes of its range). 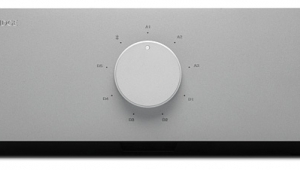 Instead, the front panel visually indicates where in the nova300's range of volume the knob happens to be set: Lacking such a traditionalone could even say instinctivemeans of informing the user where in the product's volume range the knob setting happens to be at any given time, the nova300's front panel offers visual feedback: Whenever the user is moving the knob, the lights above each of the eight input buttons form a horizontal indicator bar. When the knob is again stationary, all of those lights are extinguished except for the one above the input in use. All of the controls described above, except for the volume knob, are duplicated on the nova300's compact, aluminum-fronted remote-control handset, which adds a Mute button. Volume can be adjusted from the remote with a pair of Up/Down buttons of the usual sort. All of that is straightforward, and the nova300 threw me no curvesexcept for one in the setup regimen for its internal DAC: At first, after using a 1m-long AudioQuest Carbon USB link to connect the nova300 to my iMac, I had the damnedest time getting the computer to recognize the Peachtree. Most of us have struggled with installations in which certain items must be connected and/or powered up in a certain order, and I assumed that that was the problem herebut it seemed that no combination of connections, reboots, or what have you could get the nova300 to appear as a selectable output target in the Sound window of the iMac's System Preferences menu. After much swearing, I tried pressing the USB-B input button, saying to the empty room, "Nahhh, this couldn't be the solution." Sure enough, that did it. Which also means that, whenever I switched from USB-B to any other input, the nova300 ceased to be a selectable option on the iMac. At the very least, this anomaly should be mentioned in the nova300's otherwise fine owner's manual. 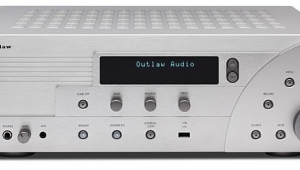 A final note: Although I'd surely been told, at one time or another, that the nova300's output stage operates in class-D, I'd forgotten that detail by the time I received my review sample. And indeed, because the nova300 ran warmnot hot but certainly not class-D coolI assumed that it operates in class-AB. That I listened to the amp under that misconception for its first couple of weeks in my home may or may not be germane to your understanding of the observations that followand ultimately I was rather shocked to realize that the Peachtree iDecco, which really does operate in class-AB, runs notably cooler. Go figure. The very first impression I had of the Peachtree nova300's sound, fresh out of the box, came while listening to the Brahms Violin Concerto with soloist Hillary Hahn and the Academy of St Martin-in-the-Fields, conducted by Sir Neville Marrinerwhose passing last year went largely unnoticed by the media (SACD/CD, Sony Classical SS 89649). The sound was slightly dry and grainy, but not without color, and certainly not without dynamic nuance, of which there already was an abundance. Clearly, some running-in was in order; before doing any further critical listening, I subjected the nova300 to a little over a week's worth of steady use as a background-music workhorse. Footnote 1: In truth, two of those switches serve double duty: When you press the Aux 1 button longer than five seconds, those inputs activate the nova300's Home Theater Bypass function, which I didn't try, owing to my enduring lack of a home theater (or a home gymnasium, home espresso bar, or home bowling alley . . . ). Footnote 2: The careful reader will note that I've described a total of eight inputs being served by seven buttons, one of the latter controlling two of the former. The eighth button, for the forthcoming WiFi board, at present can't be activated.